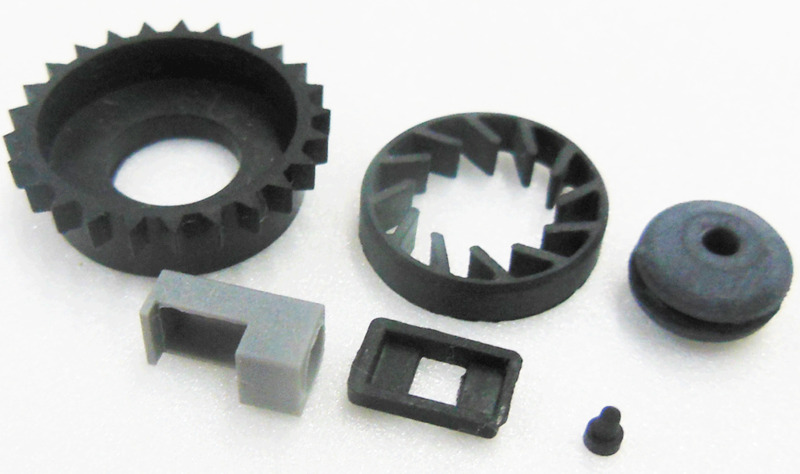 The provision of precision rubber molding products backed by the rubber core technology. Our company operates 100 to 250-ton vacuum auto molding machines to produce industrial products that meet specifications required by customers. We also produce a wide variety of components such as automobile/motorcycle components, mobile phone components and OA (Office Automation) components such as FAX machines and printers. We offer, “One-Stop Production” from material selection or molding to Assembly and even the secondary processing such as painting. At the time of production molding being complete, a non-contact diameter measuring instrument is utilized to present satisfying data. After delivery, we will provide detailed aftercare service for keeping close relationship with customers. Also, please feel free to contact us as we offer just B kneading alone. We emphasise training local staff by regularly sending them over to Japan for training. With the support of our stuff with years of experience, we are able to supply components that give a sense of safety to customers. Being creative in reducing costs such as procuring economical materials from all over the world and simplifying production processes makes it possible to provide components that meet customers’ needs and are prices competitive. KTC Group works together with Hanoi plant to better serve customers all over Vietnam with the perspective of QCD. 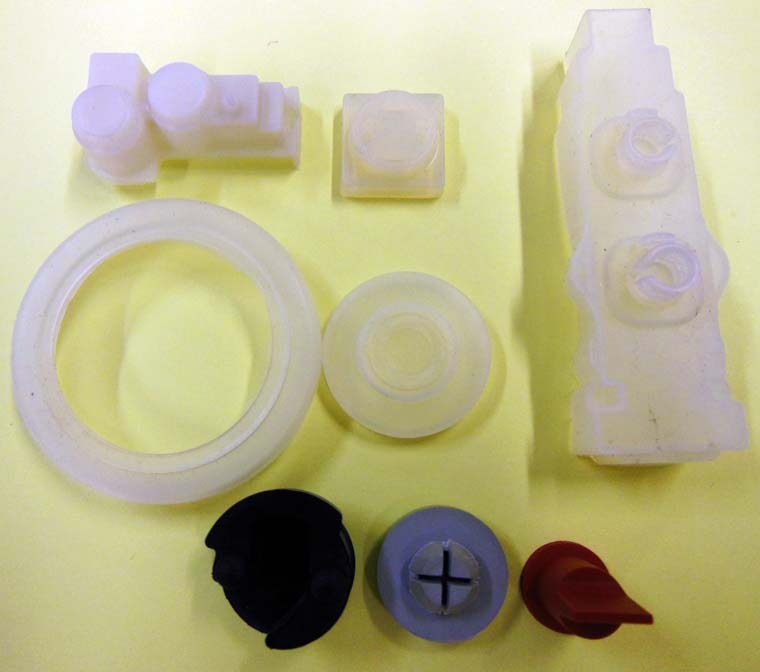 We have an integrated system for materials, molding, painting and secondary processes such as assembly. ・Ethylene propylene rubber(EPDM) >>> Excellent in weather resistance, ozone resistance, electrical insulation, etc. ・Chloroprene rubber(CR) >>> Excellent in weather resistance, heat resistance, chemical resistance, oil resistance, flame retardancy, etc. ・Nitrile rubber(NBR)　>>> Particularly excellent in oil resistance. ・Silicone rubber(Q)　>>> Good cold resistance and heat resistance, specially excellent in compression performance and electric characteristics. ・Acrylic rubber(ACM)　>>> Excellent in heat resistance and oil resistance. ・Urethane rubber(U)　>>> The strengrh is high. Excellent in wear resistance, oil resistance and ozone resistance. ・Fluororubber(FKM)　>>> Extremely high heat resistance/chemical resistance. Industrial deformed packing and grommet. We blend materials depending on characteristics such as heat resistance, light resistance, oil resistance, chemical resistance, etc. to produce and supply required packing. We produce according to rolls for copying machines and printers/FAX machines. 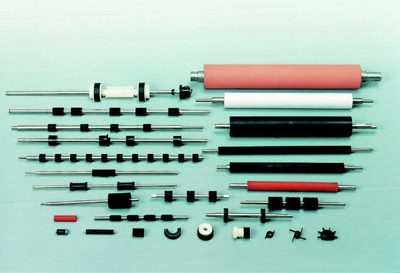 We can also supply to platen rolls, transfer sponge rolls, metal projection rolls, etc.